THE GREAT-grandchildren of one of Limerick’s most well-known matriarchs, Angela McCourt, got a first glimpse of their family heritage during a visit to the Frank McCourt Museum. Conor and Malachy McCourt, sons of author and actor Malachy Sr, flew from New York and London with their children to reunite with the clan’s past. 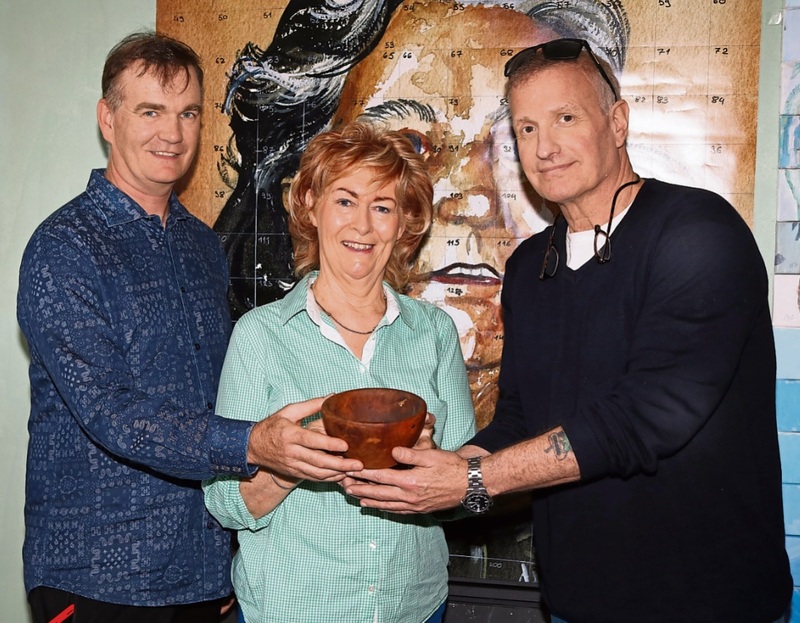 And during their visit to the museum, the two brothers presented director Una Heaton with a special family heirloom—a wooden bowl that held the last remaining ashes of their grandmother Angela. For more than 15 years, the ashes of matriarch Angela McCourt were held in a small teak-coloured wooden bowl until they were scattered over the grave of her baby daughter Margaret-Mary in 1997. These are the ashes that forged the title of one of the most renowned Irish novels, Angela’s Ashes by Limerick author Frank McCourt. And thanks to Angela’s grandchildren, this bowl of modest appearance has joined the wide range of family memorabilia at the Frank McCourt Museum on Hartstonge Street. “You could probably pick this up at a store for a buck, but it’s worth a lot more than that,” Frank’s nephew told Una on Friday afternoon. Conor said that while most of Angela’s ashes had been scattered in Limerick, the remainder was dispersed on the pauper’s grave of his aunt, baby Margaret-Mary McCourt, in New York City. “I brought the whole family together, all the brothers and all the generations, and we went there and got a little plaque made. And on that day, we took this wooden bowl, which contained the last bit of Angela’s ashes. And we took those and joined the mother and the daughter in 1997,” he said. Malachy Jr flew from London with his children, Reilly and Cassidy, to be reunited with New Yorker Conor and his two daughters Adriana and Gillian. Gillian, 15, illustrating the artistic blood that runs in the family, is already thinking about writing a book. Ms Heaton said she was delighted to have the family visit the museum.